The Apple Watch will officially launch in Belgium this Saturday on September 19, after previously being given a vague "available in 2015" launch date (via Apple Weetjes) [Google Translate]. 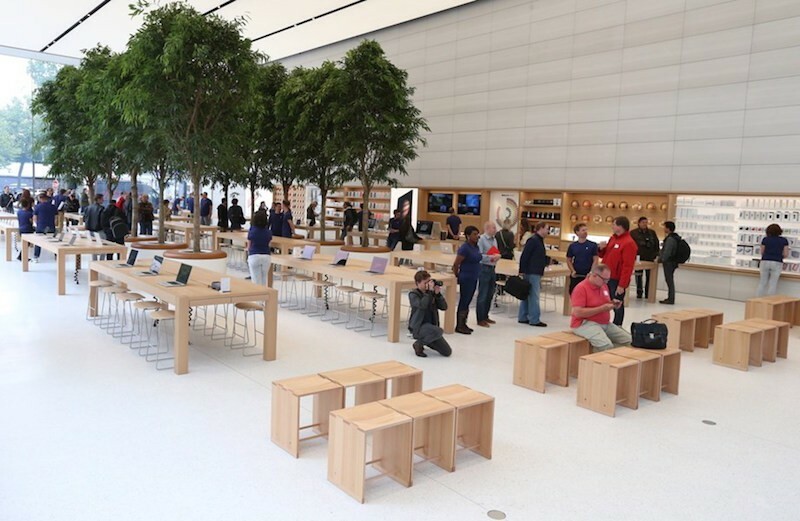 The release of the Apple Watch will also coincide with the grand opening of Apple's newest retail location in Brussels, the first one ever in Belgium, which will see its grand opening on that day. In Belgium, the Apple Watch Sport models will sell for €419.00 (38mm) and €469.00 (42mm), while the mid-tier Apple Watch line will cost customers €669.00 (38mm) and €719.00 (42mm). When first introduced back in April, the Apple Watch was restricted to Apple's own retail stores and select boutique locations. Ever since, Apple has been slowly expanding the availability of the Apple Watch, with not only cell carriers offering the wearable device but new retail chains across the world. Everything about this looks amazing. Pushing the simplification envelope. Ahrendts is doing a spectacular job! The trees, tree seats, architectural window arches, lit ceiling, high-res rear projection screen with deep blacks in that ambient light level and new layout are lovely touches. Would you look at that store? It's beautiful! Can't wait to be there at the opening. Indeed, very nice. I hope they retrofit other store with this look. I have always liked Apple's minimalism in the stores, but it had gotten a bit sterile. Adding a few trees really will add something nice. And Jony Ive who, according to his bio on apple.com, is responsible for Apple retail store designs as well as Apple Campus 2. Apparently some of the walls in this new store mirror what will be at Campus 2. And Jony Ive who, according to his bio on apple.com, is responsible for Apple retail store designs as well as Apple Campus 2. Indeed. I forgot this. I believe it's him and Ahrendts that have taken the lead on store design. They did an amazing job with this one. Also, although they look nice, I feel like the trees might be a bit messy to care for. Don't they normally shed and drip sap and whatnot?